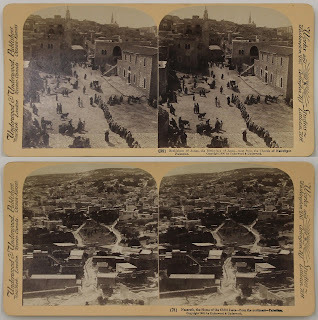 Brandeis University Archives and Special Collections holds one hundred stereoscopic images of the Holy Land, dating from the turn of the last century. They form a set which was intended to serve as a sort of tourism substitute, enabling an American audience to ‘see the sights’ without leaving home. These fascinating images, a set entitled “Palestine” produced by the American firm Underwood & Underwood, depict locations of historical and biblical significance. 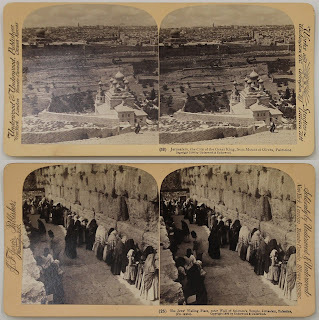 The stereoscopic slides were donated to Brandeis in 2013 by Dan Tassel, a retired physician and photographer whose “then and now” photographs of the region have been featured at the Harvard Semitic Museum, and in Haifa and Jerusalem. The slides form one part of the Dan Tassel Photography Collection which also contains photographs and printed books from the 19th and 20th centuries, as well as a stereoscope for three-dimensional viewing of the slides. Subjects of the collection include the architecture and people of the Middle East (with a particular focus on Israel), Italy, and the United States; and a historical and modern photography portfolio of Jerusalem by Dan Tassel. The collection also features works of noted 20th-century photographers Jules Aarons, Yaacov Ben-Dov, Richard Benson, Tim Gidal, and Ezra Stoller. Stereoscopic images allow the viewer, with the help of a specialized holder, to perceive two separate photographic images as a single, three-dimensional image. The technology relies upon the capacity of the human eye to fuse two images -- when presented at the right depth -- into a single one. They first gained popularity in the mid-nineteenth century; to the European and American publics, the idea of viewing photographs -- themselves a novel technology at this time -- in three dimensions was of tremendous interest. This popularity was fuelled by Oliver Wendell Holmes Sr’s 1861 invention of a more convenient stereoscopic viewer, which became the basis for future models including the one held by Brandeis and pictured here. The Underwood & Underwood slides feature the paired images on one side, with an English caption, while the other side bears the same English caption, and translations into French, German, Spanish, Norwegian, and Russian, thus reflecting the diversity of the (presumably Christian) American audience, as these linguistic groups would have included Catholics, Eastern Orthodox Christians, and Protestants among them. The choice of certain locations to photograph -- Bethlehem and Nazareth, for instance -- and the phrasing of some captions -- the Western, or Wailing, Wall is referred to as “the Jews’ place of wailing” -- underscores the extent to which these were meant for American Christians. The significance of these images is multiple. Most obviously, they are a direct window into the physical past, as they present locations in present-day Israel, the Palestinian territories, Lebanon, and Syria as they appeared 115 years ago. In another optic, the slides also demonstrate how many Americans perceived the region (or at least, how Underwood & Underwood felt that the American public might best understand the Holy Land.) And in a third light, they serve as examples of the evolution of photography, both technically, and as a popular form. These deeply interesting stereographs are available for viewing at the Robert D. Farber University Archives and Special Collections. More details can be found in the Dan Tassel Photography Collection finding aid. Filcman, Debra. "Photographer Donates Israel Then-and-Now Collection." Brandeis Now. May 6, 2013. Description by Sean Beebe, doctoral student in History and Archives & Special Collections assistant.